Jesus and his new disciples were in Galilee, in a city called Cana. Jesus and his family had been invited to a wedding. The disciples were also welcomed to come to the wedding. At one point in the celebrations, the supply of wine ran out. Jesus’ mother, Mary, came and informed Jesus of the situation. Mary was hoping that Jesus would help solve the situation, but Jesus responded by saying that it was not yet his time. Mary told the servants of the wedding to do whatever Jesus told them to do. 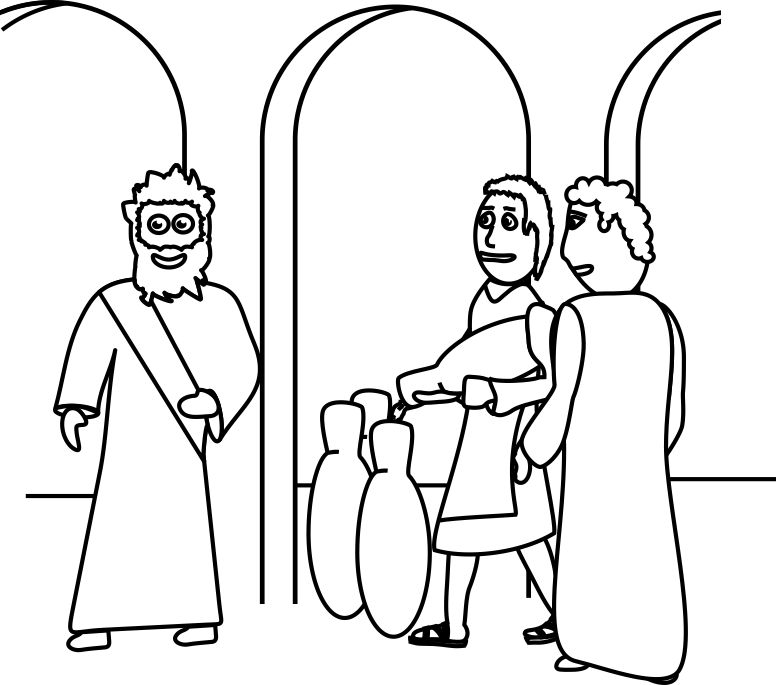 Jesus told the servants to fill 6 large stone water jars with water. After they were filled, Jesus told them to take some of it out and serve it to the one in charge of the ceremony. The water the that was tasted by the one in charge was no longer water, but wine! The man in charge was impressed with the quality of the wine that was served to him. He congratulated the groom for saving the best wine until later in the celebration, rather than serving the best first. This miracle of turning water into wine was the first of Jesus’ many miracles. After seeing this miracle, Jesus’ disciples began to believe in him. 1. Before class pour the powdered drink mix into the non see through pitcher. Fill the clear pitcher with water. If the directions on the packet call for sugar, also add the sugar to the same pitcher and stir until dissolved. 2. As you are telling the story, use your supplies as props to help tell the story. The non see through pitcher represents one of the 6 large stone jars. When Jesus tells the servants to fill the stone jars with water, pour the water from your clear pitcher into the non see through pitcher. When Jesus tells them to serve it to the man in charge, use your ladle to pour some of the newly created drink into the small paper cups. Give the drink a slight stir before pouring to ensure everything is mixed. 3. Share your newly created drink with the kids and enjoy their reactions to the ‘miracle’. Ask the kids how the servants and disciples who saw the miracle must have felt. Life is full of problems that we cannot fix. When the wedding ran out of wine, this was a big problem! Mary and the servants turned to Jesus, the only one who could fix their problem. And fix their problem he did! When we come to Jesus, and confess our sins, he can help fix what is broken and wrong in our lives. We must first come to him and share our problems with him! *This is only the first two verse of the song by Christ Rice. 2. Give the children 5-10 mins, timed, to dress one of their team members as a bride, using only the rolls of toilet paper they were given. No scissors, no tape, no glue, no staplers. Just toilet paper. 4. At the end of their allotted time, judge the beautiful brides and pick a winner. If you want to make it a little bit more exciting, bring in an outside person to be the judge! 1. Before class, print several copies of the jar template. (Think ahead to how many teams you would like to divide your children into. I recommend no more than 4 per team. ) Write the verse out on each copy of the template, and then cut the template out and into puzzle pieces. Be sure to keep each set of puzzles separated from the others! 2. Divide the children into teams. Give each team a set of the jar puzzles. 3. Have the teams compete to complete the puzzle the fastest. The winning team is the one who completes the puzzle and jumps up and reads the revealed verse together first. 4. If you want to replay the game, mix up the teams and start again. 1. Show the children several pictures of what really old water pitchers looked like to give them inspiration before they begin creating their own. 2. Give each child a portion of modeling clay and encourage them to make their own water pitcher.